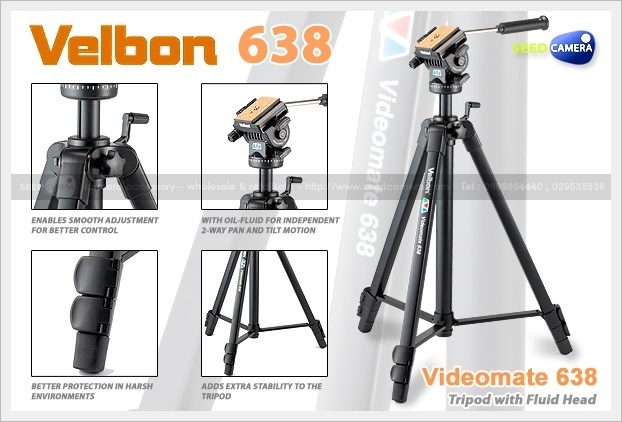 ขาตั้งกล้อง Velbon Videomate 638 ชนิด 3 ท่อน สามารถใช้ได้ทั้งภาพนิ่ง วีดีโอรับน้ำหนักได้สูงสุด 4 กิโลกรัม มาพร้อมหัวแพนรุ่น PH-368 / QB-6RL หมุนแพนได้อิสระ เก็บสั้นสุดเพียง 67 ซม. ยืดสูงสุด 171 ซม. The Velbon Videomate 638 Aluminum Tripod is a 4.37 lb camera support with a fluid pan-and-tilt head. It can reach a maximum height of 5.61' with the geared center column fully extended, and it has a minimum working height of 4.54'. This portable tripod folds down to 26.38". The Videomate 638 will support a maximum of 8.82 lb. A QB-6RL quick-release plate is included. This is an ideal tripod for today's lightweight video cameras. Smooth panning and tilting action while stopper screws are unlocked. Once the position is fixed, just release handle and lock stoppers with a soft touch.